On October 21, 2012 I will be speaking about “The Power and Illusion of Self-Organizing Teams“. My whitepaper is now available for free download. I was invited to present my book “Leadership Principles for Project Success”. Have a look at my past blogposts for deteails: https://thomasjuli.wordpress.com/2010/11/30/pm-conference-in-athens-greece-presentation-available-for-download/ and https://thomasjuli.wordpress.com/2010/12/07/photo-impressions-from-conference-in-athens/. On May 10 and 11, 2010 I conducted 2 workshops at the PMI Global Congress EMEA in Milan, Italy. The workshops were entitled “The 5 Team Leadership Principles for Project Success”. The workshop showed that project management alone is not sufficient for project success. What it takes is project and team LEADERSHIP. 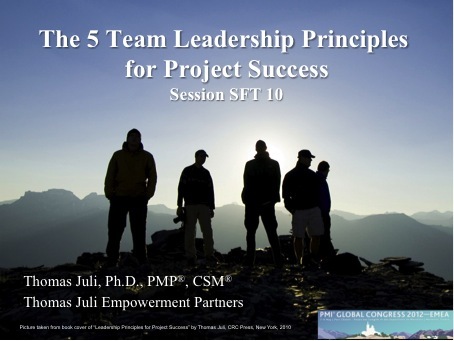 This interactive seminar presented 5 Team Leadership Principles and showed how they can help secure project success. Participants got the chance to apply the principles in exercises in the session. The presentation is now available for download. Both sessions were fabulous. Everybody participated in the exercises. A big Thank You! goes to all particpants! Pictures of both sessions are available on my online photo album. Also, there is a new online survey on identifying key factors for project success. Preliminary results are available online once you have completed the survey. As a follow-up and preparation for the PMI Global Congress in Orlando this fall, I have started an online survey on team involvement and project re-alignment. Please share your experiences and recommendations. The survey will take only a few minutes. Thanks for your insights! I conducted a workshop “Realigning Project Objectives and Stakeholders’ Expectations in a Project Behind Schedule”. The article on which this workshop is based as well as the presentation are available for download from my my website. For additional information about the PMI Global Congress, visit http://congresses.pmi.org/NorthAmerica2008/TheCongress/.